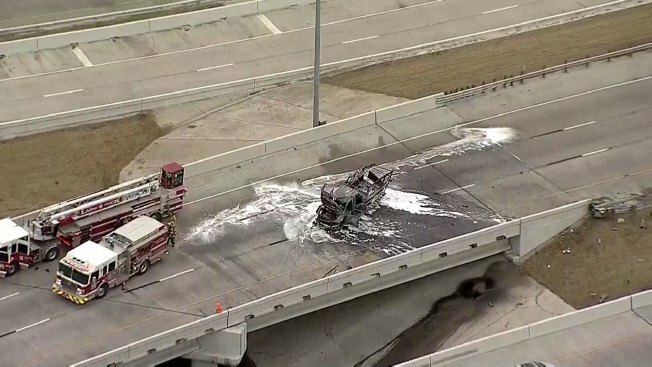 A vehicle fire shut down westbound Interstate 30 in Dallas, Dec. 14, 2018. A vehicle fire halted traffic on westbound Interstate 30 in Dallas Friday afternoon. The fire started sometime around 3:30 p.m. along the ramp leading to the Margaret McDermott Bridge just south of downtown. The cause of the fire and the condition of the driver is not known. The truck was destroyed in the fire. The highway was closed until about 4 p.m. when one lane of traffic was allowed to slip past the scene in the emergency lane. It is not known when the highway will reopen to all traffic.